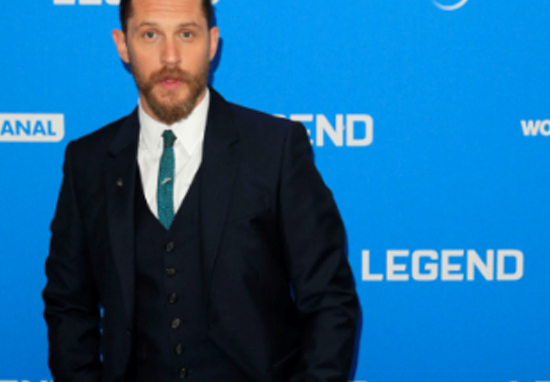 With his deep, gravelly voice and smouldering screen presence, Tom Hardy can always be relied on to bring a little extra darkness to a character. The 40-year-old actor is therefore the perfect choice to play the title role in upcoming Spider-Man spin-off Venom. Although we will have to wait until October 2018 to see Tom in that infamous black suit, excitement is already building around this latest incarnation of Eddie Brock. Intrigue escalated after the very first photograph of Tom on the Venom set emerged. 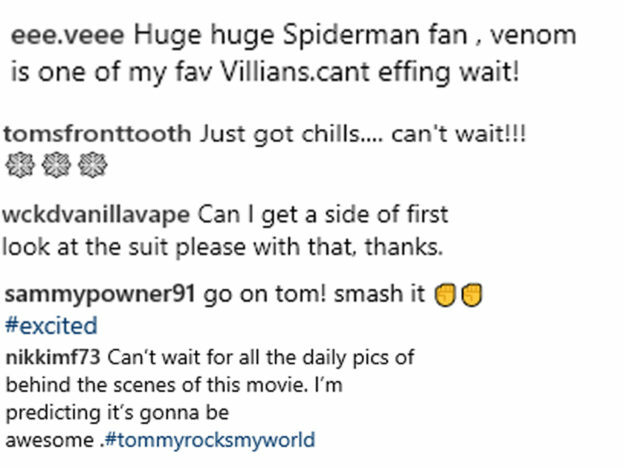 The official Instagram page for the superhero film posted a teasing photograph of Tom laughing on set, with the simple – yet extremely effective – caption: ‘Day 1. #Venom’. Needless to say, this tantalizing glimpse has whetted Marvel fans’ appetites. However, with pressure mounting, Tom and the rest of the Venom cast are going to have to meet some skyscraper-high expectations. One person warned, ‘Better not ruin the Spiderman franchise’, while another pleaded, ‘pls don’t f*ck this up’. Some diehard Spideys are understandably nervous about the plot deviating from Peter Parker’s narrative to that of his shadowy nemesis. However, if there’s one person who can capture both the menace and tragic complexities of emotionally abused Eddie Brock, it’s Tom. Hardy, like few of his peers, has the skill to show us the chinks of light that illuminate Brock’s dark and twisted, vengeful soul. And he will relish having a blank canvas to work with, an opportunity that would not have been his had the actor instead chosen to replace Hugh Jackman as Wolverine. Furthermore, there’s plenty of weight to Eddie’s character which makes him much more than a simple comic-book villain. Rejected by his father, Eddie is plagued by anger and depression. He originally showed remarkable talent as a journalist before facing disgrace and dismissal after wrongly outing the Sin-Eater murderer. It was Peter Parker in his Spider-Man persona who was the one to capture the notorious serial killer, fuelling Eddie’s obsessive, vengeful feelings. Much like Peter, Eddie’s powers are forced on him by external forces. While contemplating suicide at a church, the symbiote bonds with him, giving him formidable powers comparable to that of Spider-Man, as well as shape shifting abilities. We haven’t seen tongue nor fang of Venom for a decade, when he appeared in 2007’s Spider-Man 3, and there is still so much untapped depth to explore. Arguably Spider-Man’s biggest nemesis, Venom is the comic-book equivalent of a movie boogeyman like Freddy Krueger – he’s meant to be terrifying and villainous, but readers thought he was so cool that eventually the symbiote became less obviously evil (he always tries never to hurt bystanders), appearing in his own title. Will this be the most interesting and unusual superhero movie of 2018? With The New Mutants, Deadpool 2, Avengers: Infinity War, X-Men: Dark Phoenix and Ant-Man and the Wasp all slated for release, we’re going to have a fun time finding out.